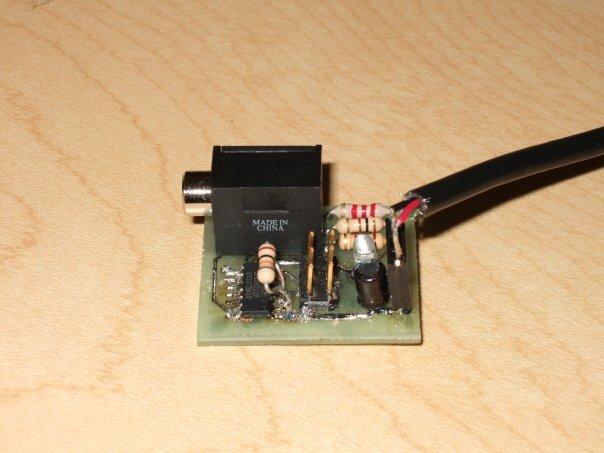 I chose the ATtiny84 microcontroller for this project because I’m familiar with the AVR architecture and I have access to the tools to use it. I bought the ATtiny84 in its SOIC-14 packaging. 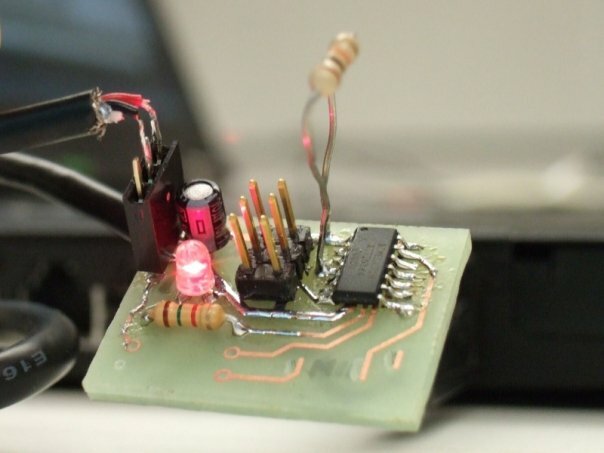 If I had it to do again then I’d choose the ATtiny85, which comes in a SOIC-8 package; it contains all the features I needed but takes up less space. It’s not a real problem though. The microphone connects to the circuit through a tip-ring-sleeve (TRS) jack. I chose the SJ1-3533N jack from CUI Inc. because it looks nice and has a small footprint on the circuit board. It breaks out the tip, ring and sleeve conductors on three pins on the bottom. 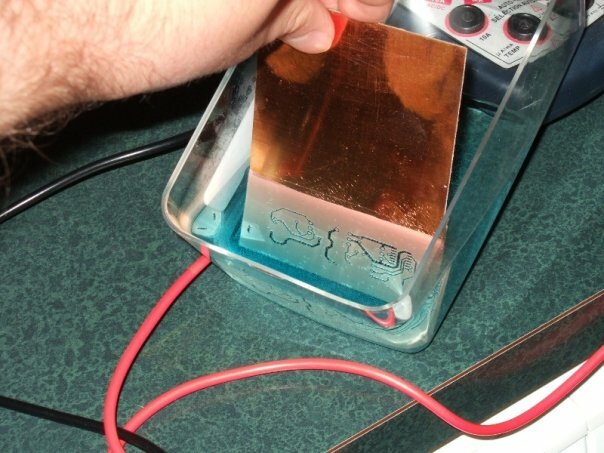 The sleeve conductor is connected to ground, and the ring is connected to V+ through a 2.2 kΩ resistor (without this resistor the microphone’s output signal is constant). 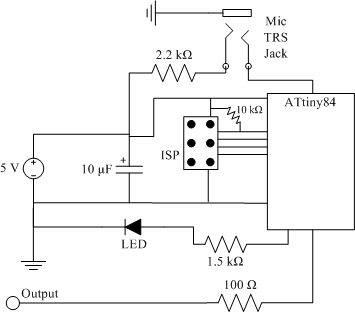 The tip conductor carries the microphone’s output signal. The circuit’s 10 μF capacitor filters the power input. The LED is for visual output. The LED’s current-limiting resistor value, in the diagram labeled 1.5 kΩ, depends on the LED. I used a low-current LED, so the resistance is quite high. The resistor value for other LEDs can be calculated with this tool, with the source voltage value set to the input voltage (5 V in my circuit) and the diode voltage and current taken from the LED’s datasheet. I used a 100 Ω resistor to protect the output. The resistor should probably be higher, but I figure it’s fine. The AVRISP connects with the red stripe on its ribbon cable at the header’s pin 1. 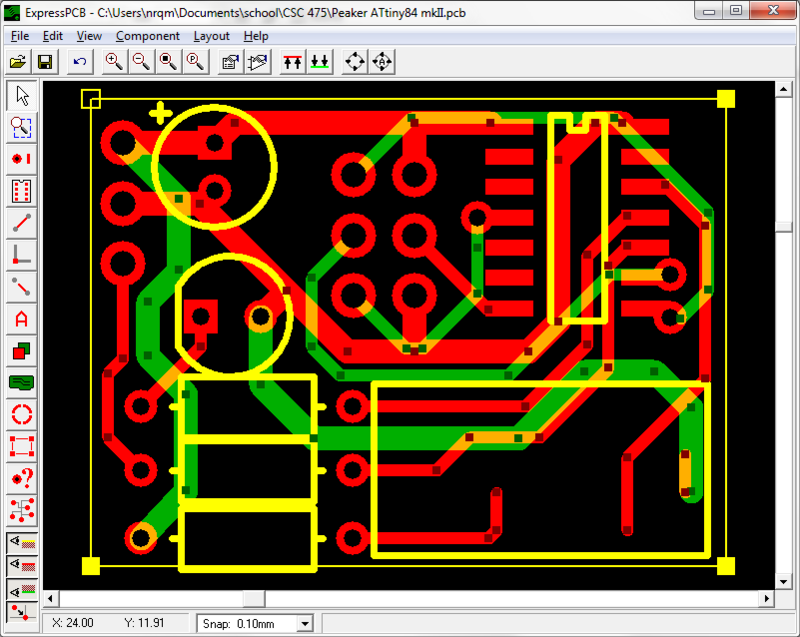 I designed the circuit board using a program called ExpressPCB. It’s not the most complete design program and it uses a proprietary file format that doesn’t work with other software, but it’s very easy to use and is well-documented. 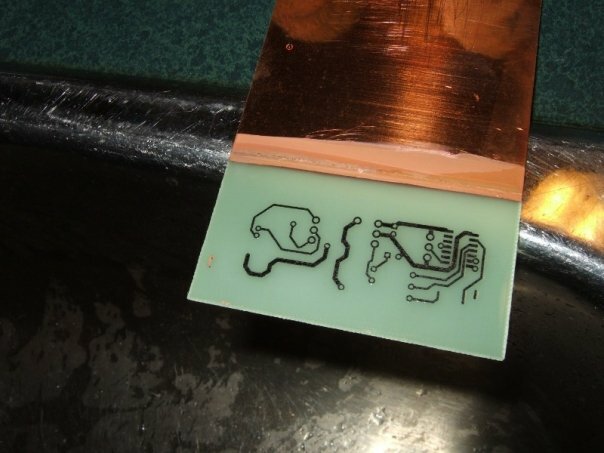 I designed the two-layer circuit board below; the red traces are the top copper layer, the green traces are the bottom copper layer, and the yellow is for silkscreened information (I don’t print the silkscreen layer, but it’s shown below for informational purposes). The large holes fit standard 0.1″ headers; they have a 1.91 mm outer diameter and 1.02 mm inner diameter. The small holes fit component leads; they have a 1.42 mm outer diameter and a 0.74 mm inner diameter. The small holes on the CPU are just through-holes that connect the bottom layer copper to the top. The three resistor spots in the bottom-left corner of the board are sized for 1/4 W resistors. 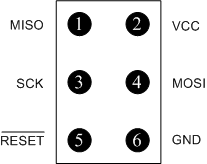 The three 0.1″ pins in the upper-left corner are, from top to bottom, for V+, GND, and the output. The ISP header is oriented with pin 1 at the top-left. This design doesn’t include the ISP port’s pullup resistor. I couldn’t figure out how to fit it onto the board. If I was going to make another version of the board I would put a surface-mount resistor between the Vcc and RESET pins to the right of the ISP port. I ended up using a 1/4 W resistor soldered above the board, between the Vcc trace and the through-hole connected to the RESET pin. I used instructions written by Christopher Garber to print the two copper layer designs onto toner transfer paper. I diverged from the instructions by printing to a 1200 dpi PDF file instead of 300 dpi; 1200 dpi gave me much better results for the final printing. I also skipped the colour-related steps and just printed everything to black, and combined the top and bottom layer images into one image for printing. I washed the toner off with acetone and cut the circuit board out with a hacksaw. Then I drilled out the through holes with a drill press, using a #60 (1.01 mm) bit for the large holes and a #69 (0.74 mm) bit for the small holes. Not all of the through-holes were drilled out on both sides, because I had erased some of the through-hole pads from the printout and so they didn’t appear in the circuit board. The V+ pin and the CPU through-holes have pads on both sides, so those through-holes got drilled out all the way through. I glued the two pieces back-to-back, making sure they were properly aligned by pushing drill bits through two of the complete through-holes. 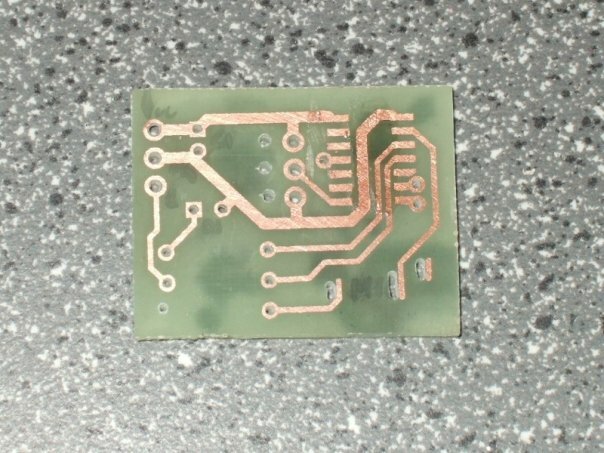 After letting the glue cure overnight I trimmed down the PCB’s edges using a rotary tool, and finished drilling all of the through-holes, leaving the final circuit board. The mic jack’s pins are very wide and narrow, so I carved them out with the small drill bit. I installed the minimum number of components I needed to load code onto the microcontroller: the power input, filter capacitor, ISP header, pullup resistor, CPU, LED, and LED resistor. With this circuit I was able to read the CPU’s serial number using the AVRISP mkII, and finally to load a simple LED-blinking program. 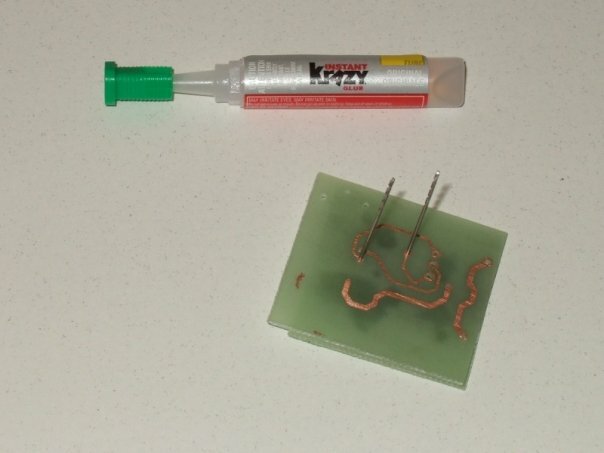 Soldering on the ISP header was very difficult because of the top layer pads: when the header was installed on the board, the pads were under the header and it was impossible to solder them to the pins. I solved this for the ISP header by putting a few metal strands from stranded-core wire into the holes. The strands wicked solder from the bottom of the board up to the pads. The strands are not easy to install and create a risk of short circuits. I solved this problem for the power, ground, and signal pins by removing the plastic base from the header row and soldering the pins into the holes one at a time. Later when I installed the TRS jack I came up with a better way to do it: drill through-holes next to the top layer pads, stick a bit of metal (e.g. 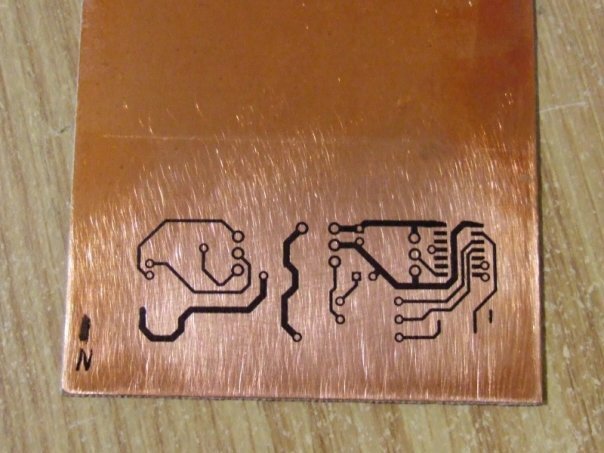 a clipping from a component lead) through the hole, and solder the top layer pad to the metal. I soldered the TRS jack connectors to the bits of metal sticking out of the bottom layer, thereby connecting them to the top layer pads via the through-holes. Finally I installed the remaining components and trimmed the pullup resistor. After I took the above photo I cleaned off the board and dipped it in polyurethane to protect the traces (this had the side-effect of making the board nice and shiney).